Happy Thanksgiving Week! 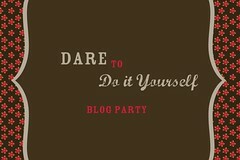 I’m linking up with all the cool kids over at NewlyWoodwards again for the Dare to DIY Party! 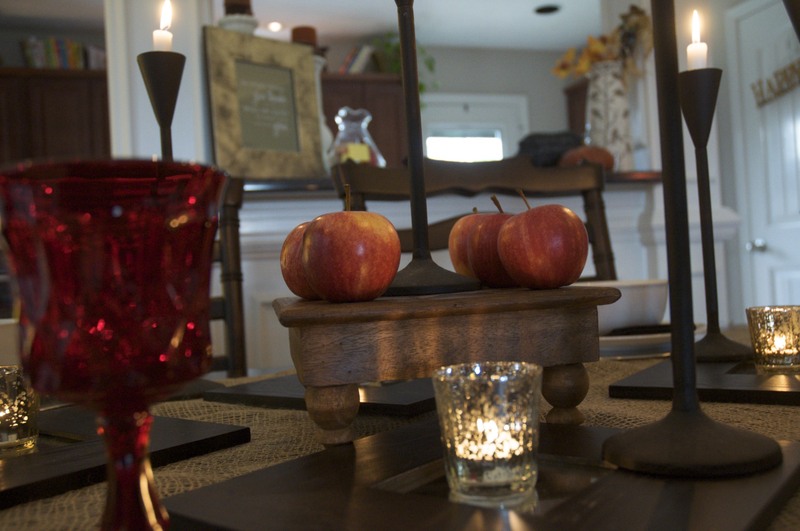 If you missed it, last week I shared our new family tradition for being thankful. This week’s challenge is Dare to Entertain. 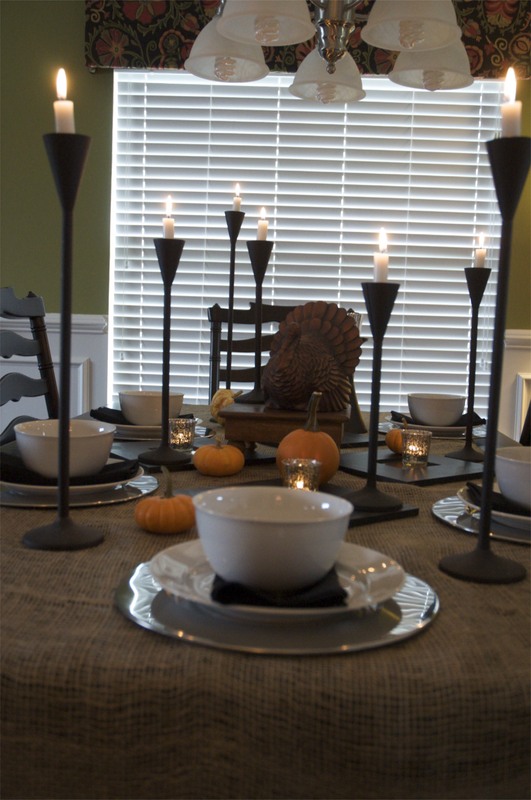 I won’t be hosting any Thanksgiving Festivities this year, but I couldn’t resist the chance to try out a fun fall Tablescape. I trimmed up the Burlap and placed it as a runner. I think this would look great over a table cloth as well (especially if it is crisp and white- yummy!) but I didn’t want to cover Paula up and it looked really nice with the dark tobacco finish of the table showing through. Then I just started layering- Ikea mirrors, candles, a little pedestal. I came up with a base that I really liked. But who wants to stop there? I didn’t. Paula didn’t. So we threw on some more layers to what we could do with a few minor tweaks. 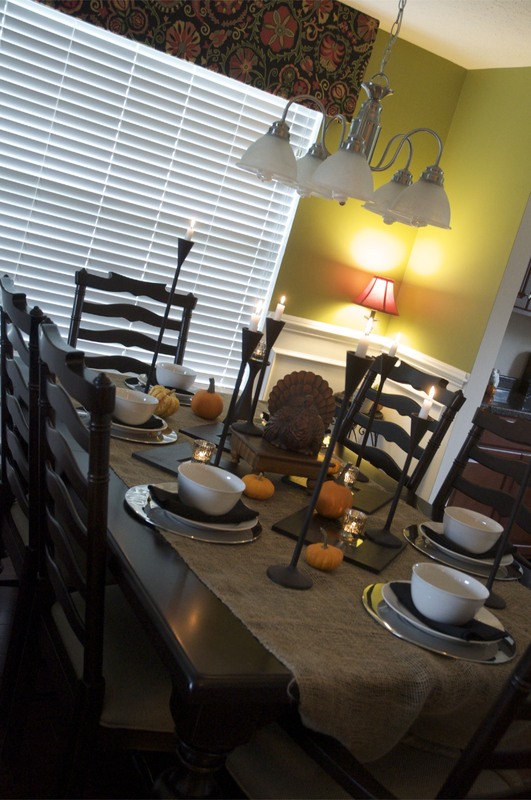 Look #1: Classic Thanksgiving– I just added some little pumpkins, acorn squash and (of course!) a turkey. 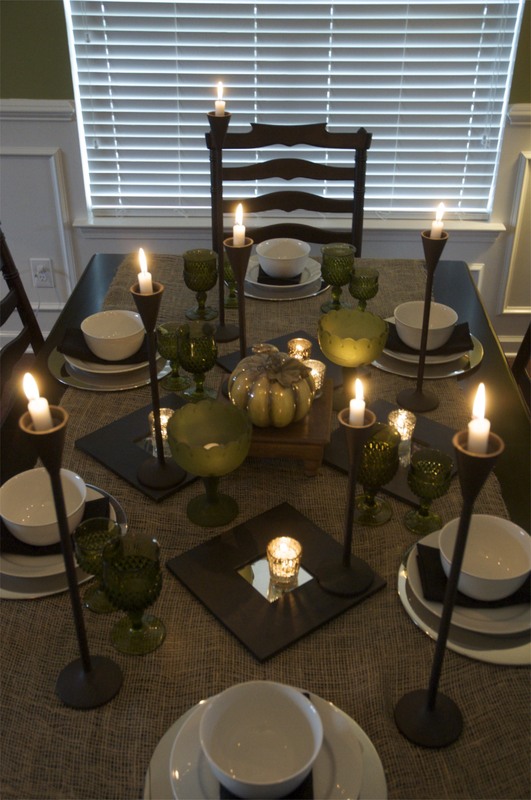 Then Look #2: Less Pumpkin, More GREEN– I added a glass green pumpkin, green candle holders and some green vintage glasses. And Finally, Look #3: Still fall, but a little less traditional. I added apples and red glasses. I think look 3 is my FAVORITE, thus the many, many pictures. 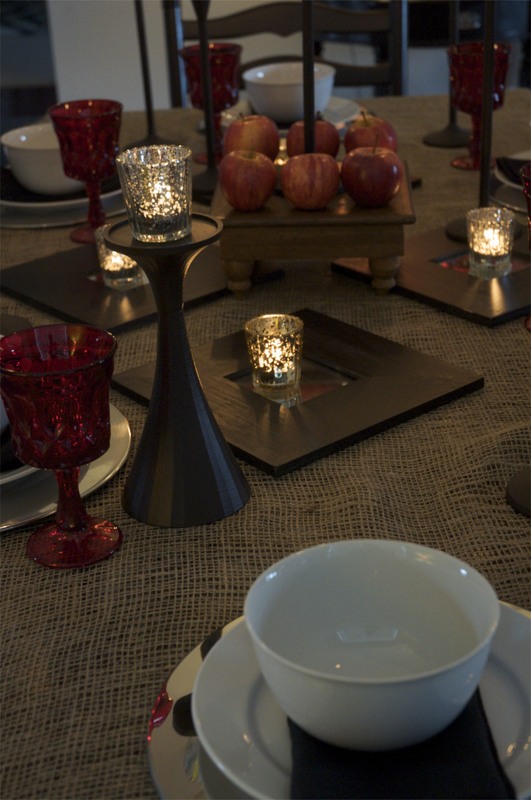 If I were hosting Thanksgiving, my table would be set just like this. It may even transfer my red and apples to Christmas. I could add some greenery and maybe some red berries. Who wants to come over? Have a “go to” basic design and then build on it. Vary your heights. 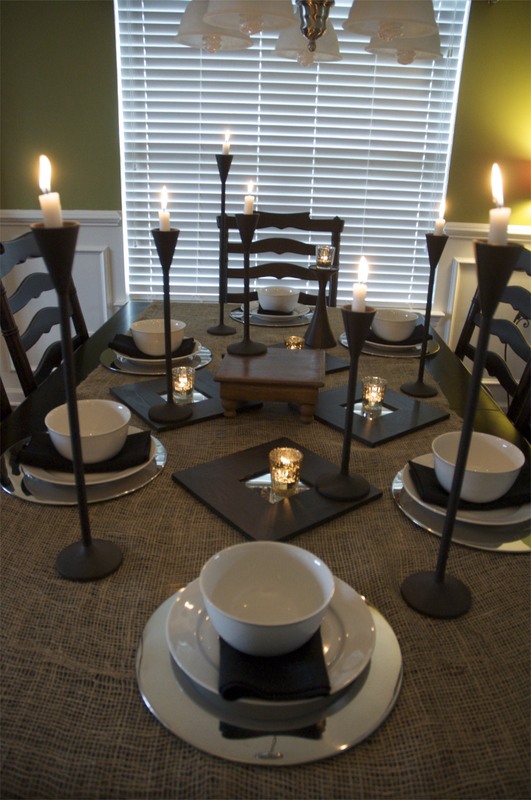 This was just a “sit down and eat” setting so I used the pedestal and various candle heights. When I do a buffet set up or place the food on the table I like to place boxes or other items under the tablecloth and then place the platters and trays of food on top for added height and dimension. While we’re here, let’s talk about the candles. 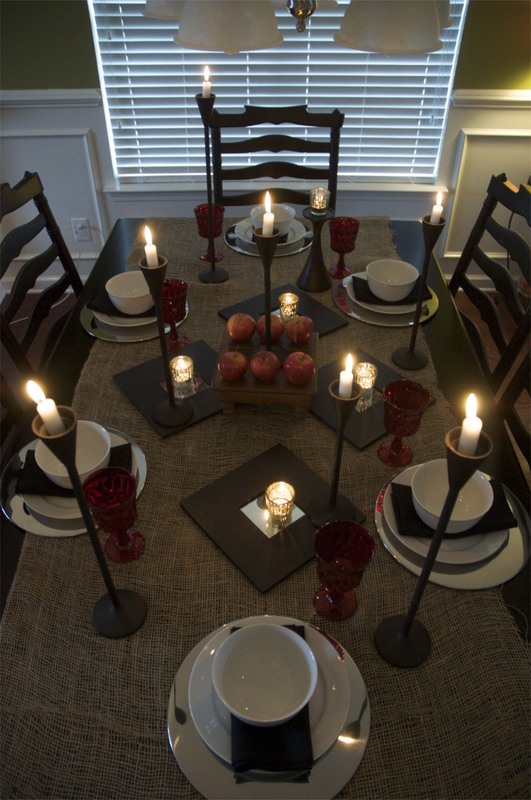 I know you get into some potential vision/conversational issues when using tall candles, but just keep them skinny and you can see everyone across the table. Number 3 just happens to be 3 things you can’t go wrong with: natural, simple and sparkle. If you don’t know where to start, focus on one, two or all of them like I did here, and you have the perfect base for any occasion. You can dress it up or down from there. My Natural- Burlap, Fruits and Veggies (you could also use flowers, greenery, berries, acorns, etc. ); My Simple- classic white dishes, black napkins and silver chargers; My Sparkle- Lots of candles, mirrors, and the chargers are sparkly too. I also multiplied my sparkle with the mercury glass candle holders on mirrors. Pretty. 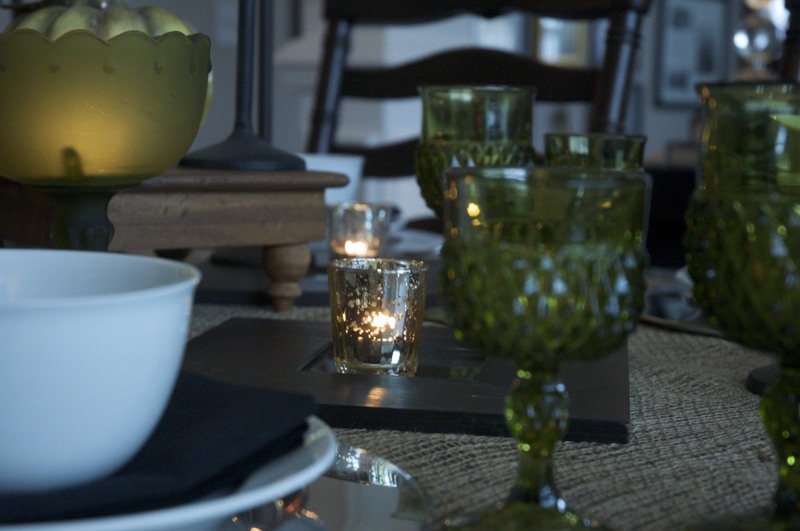 You don’t have to set your table for an event or holiday. Make it pretty everyday! 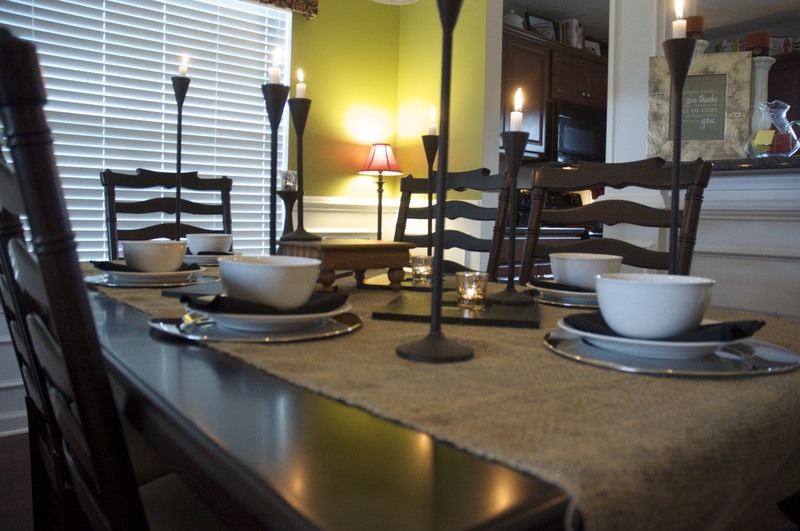 If you happen to be one of those people who has trouble keeping your table clear- i.e. your mail gets dropped there or it just attracts clutter (I am hanging my head in shame, I’m guilty of this too), anyway, having a beautifully set table makes it a whole lot easier to keep the clutter away. So, there you have it! Paula is all dressed up and ready for some Turkey! I can’t wait to see how she looks in her Christmas best in just a few weeks! This entry was posted in Dining Room, Entertaining, Holiday, Home, How To, Making it Pretty, Uncategorized by Home Sweet Here. Bookmark the permalink. This is do great. I’m pretty smitten with Paula, too. 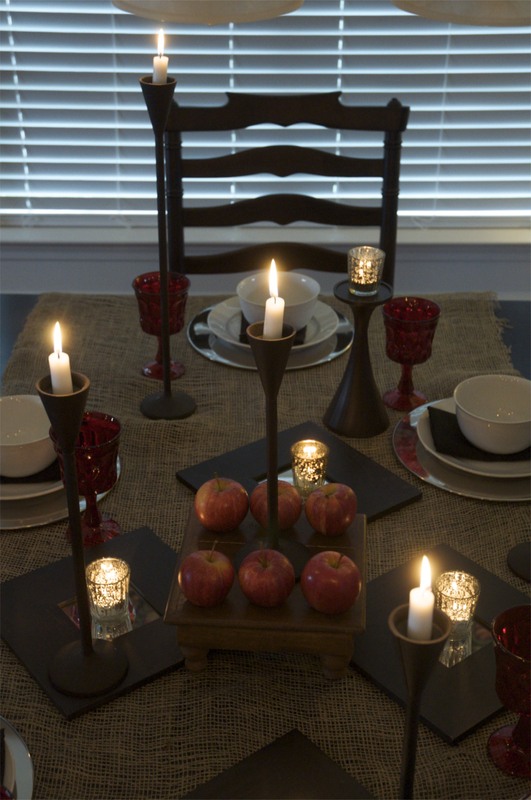 Loving those tall candlestick holders and I’m a fan of the apples, too. I think my favorite is three, biut I really like them all. Thanks so much for linking up to Dare to DIY. Thanks so much Kim! Paula and I both appreciate your kind words- haha! Thanks again for hosting such a fun party!! LOVE, love, love!! This table and the decor is beautiful!! 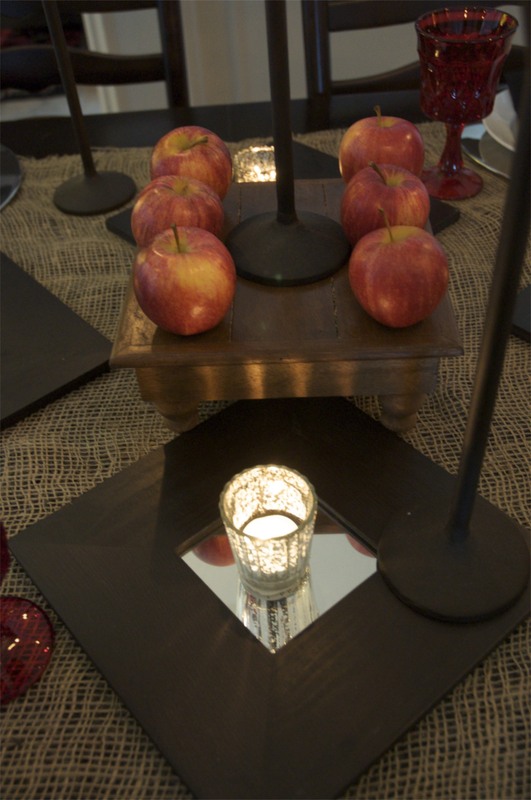 I especially like the “little table” in the middle – totally brilliant for setting off a simple centerpiece! NICE! Thank you, Thank you, Thank you! I really appreciate you stopping by!